Lemon Tart by Double Drip is a flavour blend featuring tart Lemons along with Pastry and Cream. Lemon Sherbet by Double Drip is a mix of citrus Lemons and Sherbet. 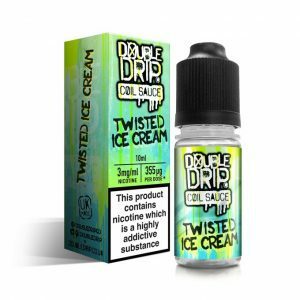 Twisted Ice Cream by Double Drip Coil Sauce has a mixture of Lemons and Strawberries, with Lime Sorbet and Pineapple Ice Cream. Sun Drip by Double Drip is a blend of Pink Grapefruit, Tangerines, and Apricots. Strawberry and Banana by Double Drip Coil Sauce features a blend of Bananas, Strawberries, and Sweet Waffles. Raspberry Sherbet eLiquid from Double Drip is a blend of Raspberries and sour Sherbet. Orange Mango Chill by Double Drip features a blend of Mangoes, Oranges, and Menthol. Mango Raspberry Ice Cream by Double Drip features a mixture of tropical Mango with Raspberries and Vanilla Ice Cream. Crystal Mist by Double Drip is a fruity blend of Blue Raspberries with Black Cherries, along with notes of Menthol. It's intended to be reminiscent of an iced slushie.